Alexander “Al” Schacht was born on November 11, 1892 in the Bronx, New York. The Clown Prince of Baseball, as he would become known, was a self-confessed baseball addict who had pitched for the Washington Senators between 1919 and 1921. A sore arm ended his playing days but he turned to coaching and also developed a comedy routine that consisted of comic acts, jokes and player impersonations. During rain delays he was famous for plopping down in a mud puddle with two bats, and rowing as if he was in a boat. He was also known for staging mock boxing and tennis matches on the field. “It was not until the summer of 1942,” Schacht wrote in GI Had Fun, his autobiographical account of his wartime tours, “some six months after Pearl Harbor, that World War II first affected me personally. In the middle of Schacht’s clowning tour in 1943, he was asked to visit Portsmouth Naval Hospital to entertain the sick and wounded. This proved to be the inspiration to go overseas and entertain the troops away from home. On July 28,1943 he left LaGuardia Airport on board a clipper bound for Port Lyautey in Morocco, North Africa. Schacht traveled light. 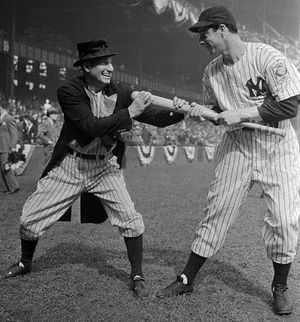 All he took with him was a Yankees’ uniform, top hat, frock coat, oversized ball glove, regular glove and his spiked shoes. Port Lyautey is 60 miles from Casablanca and served as an anti-submarine base, with PBYs flying against German U-Boats. 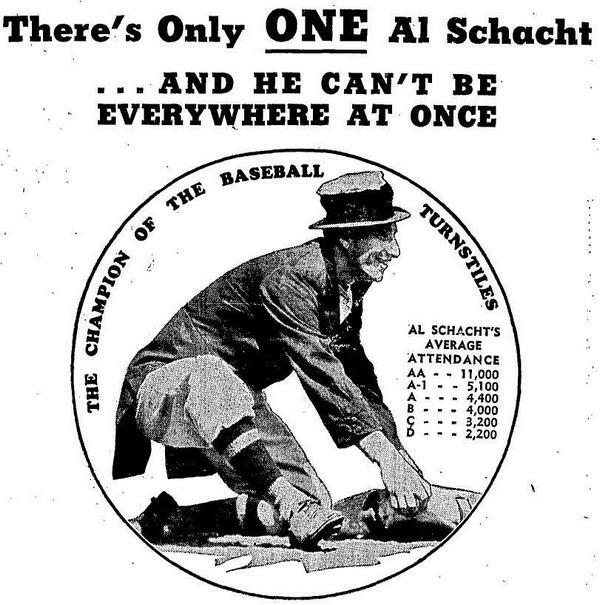 Schacht staged his first overseas performance at the port, an impromptu show at a ball game where he performed his “nearsighted pitcher” routine. Schacht staged shows at camps and hospitals throughout the area before moving on to Algiers which was home to Allied Headquarters and an embarkation point for troops who would be heading to Sicily. Again, Schacht staged a number of official and impromptu shows and even gave a performance on the cruiser USS Savannah. Tunis, the capital city of Tunisia, was Schacht’s next stop and he toured here with a band, before departing for the island of Sicily where he put on performances in Catania and Messina. Schacht then returned to Tunisia and staged a show at a baseball game in Bizerte between the 61st and 26th Station Hospitals. He also spent a lot of time at the 81st General Hospital entertaining the wounded. Schacht performed before a crowd of 20,000 at a baseball game in Bona and put on his last official show at a hospital in Constantine, Tunisia, before heading back to Port Lyautey for the journey home to the United States. Schacht returned home on September 27, 1943 and was soon involved in Bond rallies, shows at Army camps, appearances for the USO and Red Cross and visits to hospitals. On September 3, 1944, almost a year after returning from North Africa, Al Schacht left the United States for another tour. This time he was headed for New Guinea in the Pacific. His first show was held for 500 GIs at Natzab, before moving on to Oro Bay where he put on performances for the 363rd, 362nd and 139th Station Hospitals. 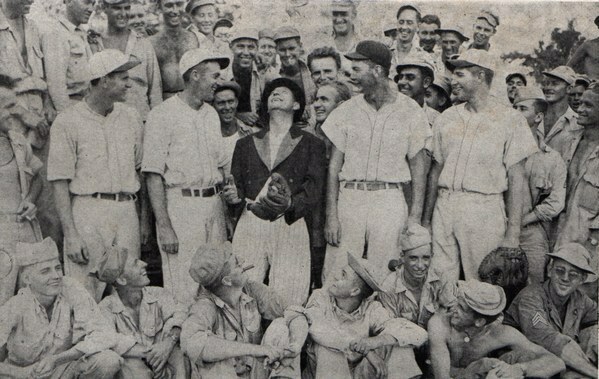 Schacht entertained servicemen at ball games staged by the 38th Infantry Division, 1st Training Center, 278th Quartermaster Corps and 5th Replacement Depot, where he met up with major leaguer Morrie Arnovich. Schacht also put on a show at a football game in Oro Bay, it was the first game of American football ever staged on New Guinea. Schacht’s next port of call was Finschhaven at the northeast tip of New Guinea. “Finschhaven is the only place in the world where you can be knee-deep in mud and still get dust in your eyes,” wrote Schacht. He covered fourteen hospitals including the 126th Station Hospital, 4th and 60th General Hospitals, and the 2nd Field Hospital. He performed for the 97th Engineers, 14th AAA, 382nd AAA, and at the first anniversary of overseas duty of the 91st Naval Construction Battalion. Hollandia was Schacht’s next destination in New Guinea. It was here that the 24th Infantry Division were waiting to invade the Philippines. On October 1, 1944, Schacht performed at the New Guinea World Series before major league players Hugh Mulcahy, Ken Silvestri, Al Flair, Al Kozar, George Byam, Irv Dusak and Louis Rosen. Schacht roomed with war correspondents Bill Chickering of Time and photographer Frank Prist in Hollandia. Both were killed during the invasion of the Philippines. Schacht performed for the 71st and 79th General Hospitals before moving on to the island of Biak, where he performed for the 41st Infantry Division, at a championship ball game at Bosnek Field and at an airfield at Owi. Schacht returned to New Guinea and entertained troops at ball games, hospitals and for sailors at the docks around Milne Bay before returning home on October 26, 1944. A year later, Schacht was again off to the Pacific. This time he went to Manila, in the Philippines where he entertained troops at camp mess halls and ball games. From Manila, he went to Japan and staged his act before a game in Osaka. In all Schacht gave more than 120 shows during the eight-week tour. In 1946, Schacht was given the Bill Slocum Memorial Award. The Slocum Award is presented annually by the New York Baseball Writers Association to a person judged to have a long and meritorious service to baseball. His comedic act both for baseball fans and GIs brought him a well-deserved reward. 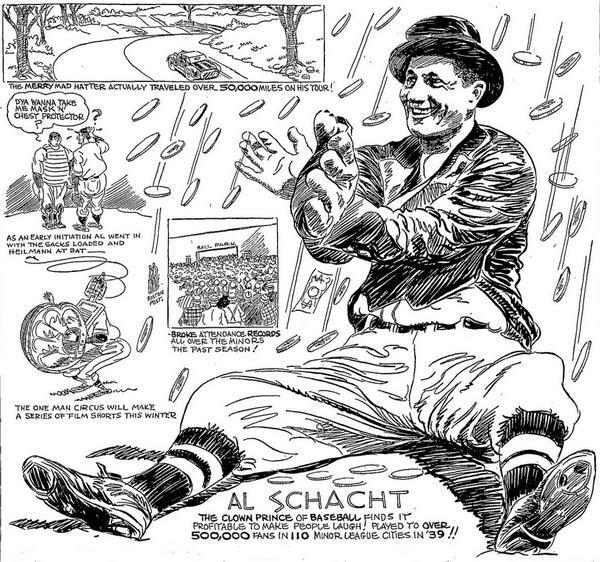 After the war Al Schacht concentrated on his successful New York restaurant and continued to perform at ball games. He retired in 1969 and passed away on July 14, 1984, in Waterbury Connecticut. He was 92 years old.